SEASONED EXECUTIVES. STRATEGIC INSIGHTS. WORLD CLASS TRANSACTION EXPERIENCE. 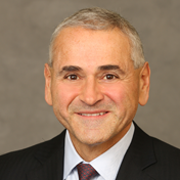 Doug Braunstein is Founder and Managing Partner of Hudson Executive Capital. He currently serves on the Board of Directors of Cardtronics plc, Corindus Vascular Robotics, Inc. and Eagle Pharmaceuticals, Inc.
Doug has over 30 years of industry experience and held a variety of positions during his tenure at JPMorgan Chase & Co. which include Vice Chairman, Chief Financial Officer, and member of the Company's Operating Committee. He was also Head of JPMorgan's Americas Investment Banking, Global M&A, and Global Head of Industry Coverage. He served as a member of JPMorgan's Executive Committee and the Investment Bank Management Committee for over a decade. Doug has been an advisor to numerous boards and management teams in the planning, structuring and implementation of the full range of corporate finance solutions. He has worked on over $1 trillion in transactions. Doug is a trustee of Cornell University, and serves as chair of the Finance Committee and holds seats on both the Executive Committee and the Investment Committee. He also serves on Harvard Law School's Dean's Advisory Board and is a co-chair of Harvard College Fund Parent’s Executive Committee. He is a member of the Economic Club of New York and a member of the UJA of Greater New York's Wall Street and Financial Services Division. Doug received his B.S. from Cornell University in 1983 and his J.D. from Harvard Law School in 1986.